Our professional drivers, dispatchers and warehousemen are experienced in the movement and handling of all kinds of freights. From LTL shipments to full trailer loads, your shipments will be handled by courteous, knowledgeable personnel and supported by the latest technology, equipment and a modern fleet. 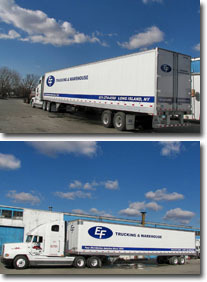 E&F provides all the necessary logistical services to Importers, Exporters and Retailers on a local, regional or nationwide scale. Our E.D.I. system enables us to electronically check cargo availability at all ports, as well as track, trace and provide up to the minute cargo data from delivery order to proof of delivery. In addition, our new Speedscan system allows our customers to view proofs of delivery on the internet within 24 hours of shipping. Responding to your changing priorities and providing the solutions is why we are the leading resource for smart business.